The Grand Canyon ride this year has been split into two, 3 day pioneer rides. In the past, it was a single, 5 day pioneer ride. The grand experiment for the 2018 season by XP Rides has been to turn all previous 5 day rides into two 3 day rides with a rest day in between. So far, I’m liking it. 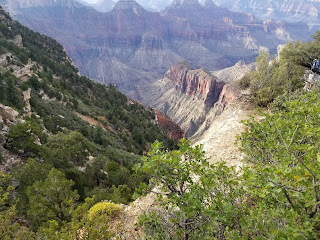 On the rest day, Wednesday, I headed into the Grand Canyon North Rim National Park. Entry was $35, but with access to the internet at the Lodge, an excellent restaurant with a view over the rim *and* offering gluten free pancakes on the breakfast menu, plus a place to shower and do laundry, it was well worth it. After I’d gotten my shower and done my laundry, I got ice and coffee and headed back to camp. When I went to put the ice and coffee in the camper, I discovered I couldn’t get the door open. I decided it was something I should deal with in camp, so headed back. Once back at camp, I tried again to open the camper and was utterly unsuccessful. Using the key made no difference, either. Thinking I might have better luck from the inside, I got the step ladder out of the trailer and crawled in through the camper window. It turned out being inside just meant I couldn’t get out rather than not being able to get in. For the last 30 years, a 100-mile endurance ride and a 100-mile endurance run have taken place concurrently in West Windsor, Vermont. Steve Rojek was out at the Western States Trail Ride (also known as the Tevis Cup) many years ago and decided a similar event was needed on the east coast. The Vermont 100 has been ridden for the last 38 years. Then they added the run. 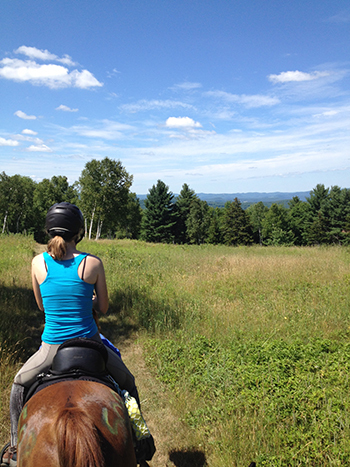 There is also a 75-mile endurance ride and a 50-mile endurance ride (both called Moonlight in Vermont – the rides start later in the day so that you finish at night and get to ride in the dark). In addition to the 100 mile run there is a 100km run.